I think Century from Toyota is the best car in the world!! One of my friends used to drive this car, and I sometimes had a chance to drive his. It was amazing that you can't imagine how confortable this car is...from both driver's point of view and passengers'. I was so surprised when I found massage chairs and they can be warm to make passenger more confortable. 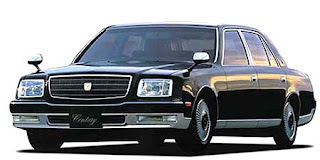 I can totally understand why Japan's emperor chose this car! In addition, I love its looks, too. I love older model much better than the new one because old one is more like square whereas the new one has curve lines and ball-like shape. Black is the best color for this car I think. However, the "Black" is not just "Black": it says "Kamui Black". Kamui means "God", and this term perfectly fits to this car !!! more details in the youtube...Check it! !